Pretty Much The Best Comedy Show includes a host, feature act, and guest comedians, providing nearly two hours of entertainment at the Capital Region’s premier alternative comedy room. NYC-based stand-up comedian Adam Mamawala will be headlining Pretty Much The Best Comedy Show at Proctors Theatre on Saturday, December 29. His debut album One of the Good Ones, released through Comedy Dynamics, debuted at #1 on the iTunes Comedy Charts in December of 2017. 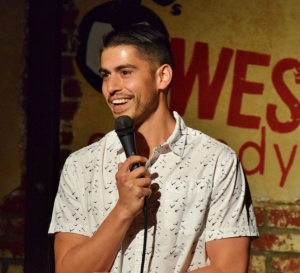 Named one of Funny or Die’s “Top 30 Under 30: Comedians to Watch”, Adam has appeared on Comedy Central, MTV, BET and SeeSo and has headlined over 200 colleges across more than 35 states. Adam’s recent festival appearances include the NBC/Second City Breakout Comedy Festival, Laughing Skull Comedy Festival, and the New York Comedy Festival. He has been featured as Time Out New York’s “Joke of the Week”, has been a Freelance Contributor to Saturday Night Live’s Weekend Update and Someecards, and recently headlined Caroline’s on Broadway, one of NYC’s preeminent comedy clubs! This edition of Pretty Much The Best Comedy Show will include host Ethan Ullman and feature acts for nearly two hours of in-person, live stand-up comedy entertainment. Lineup is subject to change without notice.